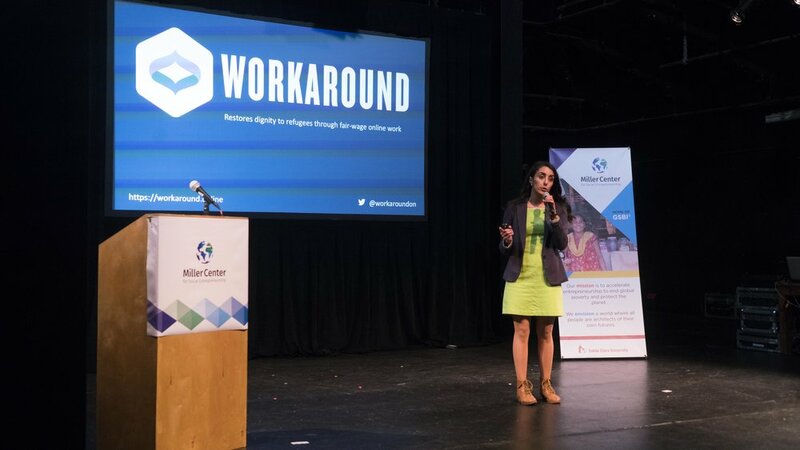 Miller Center’s Social Entrepreneurship at the Margins (SEM) accelerator program graduated a cohort of 18 organizations in December 2018 that are all serving and/or led by refugees, migrants, and human trafficking survivors. As we accompanied the entrepreneurs leading these organizations over the past year, we learned more about the needs of social enterprises serving these marginalized communities that were formerly supported solely through humanitarian aid. In order to share our learnings and encourage other stakeholders to join us in this work, Miller Center convened and facilitated a panel at SOCAP 2018, presented at the December 2018 ANDE Network Update, and is now publishing a report, “SOCIAL ENTREPRENEURSHIP AT THE MARGINS Helping Refugees, Migrants, and Human Trafficking Survivors Reclaim Their Futures”. An important tension that surfaced throughout the SEM accelerator program is the gap between the funding needed by each enterprise to grow its impact and the minimum investment current refugee-focused funders are able to deploy. This disconnect emerged onstage at our SOCAP panel discussion featuring 4 SEM program alumni and 3 funders including Omidyar Network, Open Society Foundation, and KOIS Invest. Experiences of the SEM accelerator social enterprises confirm a gap between what social enterprises in the emergent sector need and what funders seek. Impact funds for refugee-focused entrepreneurship are seeking organizations with earned revenue in excess of US$1 million. Our panelists shared that typically seed-stage funding for start-ups comes from friends and family. Many refugee-focused social enterprises haven’t yet attained $1 million in earned income, however, in order to implement their growth strategies, need more funding than can reasonably come from friends and family. I wondered: how would an entrepreneur who is also a refugee have a network of friends and family with money to fund her start-up? How can entrepreneurs looking to fill in the large gaps left by humanitarian aid change a broken system with only donations from friends and family? This is an essential question for those pledging to fund the creation of new systems that can better support our world’s most vulnerable communities. Is reserving both philanthropic and impact investment capital for only those enterprises that are able to scale to US$1 million of earned revenue really helping change the broken system that is leaving millions of people in refugee camps for decades? Is it even making refugees more comfortable? In this same speech, Giridharadas calls on philanthropists to provide the capital to “serve as the start-up incubator for government action [...] test things in the quiet of philanthropy and then seek to mainstream them into our laws and institutions and systems.” Using philanthropic capital to propagate emerging, more socially responsible systems, is not a new idea. Monitor Group and Acumen Fund’s “From Blueprint to Scale - the case for philanthropy in impact investing” talks explicitly about the idea of “enterprise philanthropy” and how, “philanthropy is the essential but often overlooked catalyst that unlocks the impact potential of inclusive business and impact investing.” The urgency and scale of the refugee crisis demands impact capital solutions across the entire spectrum of available options. Philanthropic capital is a key part of the equation, and could be the vehicle that ensures the nascent social enterprise solutions that support refugees are able to flourish and exceed that magical–some might argue arbitrary–million dollar revenue mark. Natasha Freidus, co-founder of Needslist and a Miller Center SEM program alumni, agrees, “I find it disappointing that philanthropic institutions who frankly, can afford to take the risk, are not investing in early-stage startups or providing philanthropic capital to help cover the 'pioneer gap'." Miller Center and other stakeholders, such as the Refugee Investment Network, are working diligently to try to connect the seemingly disparate needs of entrepreneurs whose passion is to change a broken system and impact investors who are averse to risking capital in new and untested ways. There is no impact without risk. You can read more about our findings from working with our initial Social Entrepreneurship at the Margins cohort in our report: SOCIAL ENTREPRENEURSHIP AT THE MARGINS Helping Refugees, Migrants, and Human Trafficking Survivors Reclaim Their Futures. We look forward to hearing from you about how we can work together to build new and better systems that allow everyone in our human family to thrive. Marie has been working as an educator for 10 years. After discovering the concept of social enterprise in 2012, she has been focused on learning about and supporting the growth of the ecosystem through running various education programs at Impact Hub San Francisco and more recently with Miller Center for Social Entrepreneurship. Inspired by her Miller Center work with maternal and child health organizations in east Africa, Marie has also recently trained and now practices as a birth doula through the SF General Hospital volunteer doula program. Over the last decade, I have worked directly or indirectly with dozens of social enterprises tackling energy access. Solar lights, biomass-powered chillers, and solar pumps are just a few of the well-known technologies that have been proven to dramatically improve quality of life for the global poor and often pay for themselves in as little as a few months. The challenge remains getting them out to everyone who can benefit from them. We understand that it’s more than a distribution problem, aspects of which Miller Center originally documented in 2015 in Universal Energy Access: an Enterprise System Approach. There remain persistent business model and financing challenges, which we have explored in our latest paper, Closing the Circuit: Accelerating Clean Energy Investment in India, written in partnership with the William Davidson Institute at the University of Michigan. Progress has been made, as evidenced by the number of people lacking modern lighting dropping from 1.5 billion in 2009 to 1.1 billion in 2018. We are moving in the right direction, but not fast enough to meet United Nation’s Sustainable Development Goal #7 of affordable and clean energy for everyone on the planet by 2030. I go through periods of optimism and pessimism about achieving anything close to such an audacious goal. Logic dictates that the easiest to serve are being reached first, so progress will get harder instead of easier. Sure, I am optimistic when I hear about new technologies, business model innovations, and new investment funds focused on energy access. But I also become pessimistic when I talk to brilliant, committed, focused entrepreneurs who are spending more time fundraising than running their businesses. Right now, I’m optimistic, having spent last week in Delhi for events including the National Dialogue on Distributed Renewable Energy and an Energy Access Practitioner’s Roundtable. These events culminated Miller Center’s work over the last three years with New Ventures to implement the USAID-supported Energy Access India program, providing accompaniment to a portfolio of 30 social enterprises and developing relationships with key investors. Much of the optimism comes from spending time with dear colleagues including the New Ventures India team, our advisors, Rakesh Rewari and Harvey Koh, and many of the social entrepreneurs we have worked with. There have been wins for many of the entrepreneurs in the program, including major investment into Cygni and Husk Power Systems. Yet, lack of capital is holding companies back. $275 billion dollars of investment are needed to provide enough off-grid and mini-grid systems to achieve SDG #7. The best that social entrepreneurs can do for themselves is develop a solid business plan, a justifiable ask, and seek out capital that is aligned. But I am now convinced that ever larger numbers of capable social enterprises with strong business plans alone won’t unlock capital. To many of us working at the ecosystem level, it is clear that there are many excellent entrepreneurs that are not getting funding, or are getting funding, but not in a timely and efficient fashion. Why is that? One of the biggest areas of learning for me during this project was to better see the energy access challenge from the investors’ point of view. I had the privilege of working with investor-minded colleagues like Mark Correnti (now of Shine Campaign, a co-sponsor of Closing the Circuit) and directly with insightful investors. Through them, I have learned much about what unlocking capital truly means. Investors face their own sets of constraints that guide how they deploy capital. In our research for the paper, we detected opportunities for investors to consider alternatives in credit risk assessment to increase access to affordable, short-term debt and to develop a more realistic risk/return spectrum for clean energy investments (especially in India). Progressive investors such as SunFunder are proving that such investments can work. We hope these models will be built on by others. Of course, it’s easy to write these ideas here and much harder to implement them. Yet, given the proven clean energy solutions we have at hand and the knowledge that energy access is an enabler for so many quality-of-life improvements, shouldn’t we all continue our push to support the intrepid energy entrepreneurs who are at the forefront of this movement? Since joining in 2008, Andy Lieberman has been a driver in developing Miller Center's strategy, programming, and curriculum. He is also responsible for many of the efforts to formalize Miller Center's knowledge into whitepapers and presentations.